Our plane out of Egypt! Another thing I wanted to talk about after we got home from abroad, and that I haven't had the chance to, was British Airways. In fact I think I finally found something, that we Americans do better than the British: air travel. Back in the days of my traveling naivete (I'm still naive to travel in many ways) I dreamt of flying on BA (pronounced bee a), as they call it. I suppose I expected a huge cultural difference, which there is of course, but after flying Egypt Air, I can say that those reason seems rather silly now. However I don't want to give you the wrong idea, the flight, the British Air flight that is, was better, more comfortable, and probably the nicest flight I've ever taken. However, the customer service prior to the flight, left me prior to our trip, wishing for my American Airline expectations. See in that lies the problem. When I booked the flight, I booked a British Airways Itinerary knowing that it would be mostly served by AA metal on the international flight. Even when it was the BA's, posher birds, I'd still accrue AAdvantage miles on my trip. Now when I book my flight through AA, I'm able to immediately pick my seat and rest in comfort for the remainder of the time leading up to the trip, knowing my tuchus has a place not reserved in the luggage hold. However, with British Airways, they don't let you choose your seats till 24 hours prior to departure, unless you're willing to pay an additional sum of money. A lot of money, which after you do the mental mathematic olympics, converting Great British pounds into dollars, seems like an unthinkable amount of money on a student ticket. What this means is, if you're traveling in tandem with a companion, as I was, there is a possibility of being separated. Of course I didn't find this out from BA, they refused to respond to my email. (Still un-replied till this day.) After talking to some veteran flyers, they walked me through the process. Not only did I have to wait, but I also needed to obtain the appropriate record locator number since the one I had was for one system, and BA uses another. (Recognizable by not being able to log-in to BA's site.) May I also mention, this British Airways policy also locks you out of choosing your AA seats because it's a code-share, and despite it being an American Airlines aircraft, and despite it showing on my AA reservations account, you're forced to suffer the cruelty of the monarchy. Eventually I emailed a second request to British Airways asking for the locator number, so when in fact the 24 hour period arrived, (I'd be in Belgium at the time,) I could hunt down some Internet and pick our seats. Luckily our friend Christie let me do just that. But wait, let's get back to the email. They never replied to that one either. Ever. (Do they even check their email?) So as the date of our trip approached, I resorted to how my grandparents used to contact people before email and twitter, and rang the 1-800 number for British Airways. There I was greeted with a rather friendly Hindu sounding man (Hey... I thought you were British!) who kindly gave me the number then hung-up on me before I could ask him any further questions. On our last day in Brussels, we had already exited Belgian immigration and were trying to find our gate when we realized British Airways had cancelled our flight to London. We were supposed to be in Cairo that night, but now we were forced to go back through immigration, re-enter Brussels and find a British Airways worker. (Not to mention contact Cairo and tell them of our conundrum.) While the British Airway's agent was nice and did book us on the first Egypt Air flight, direct, I think I sensed some hesitation in her voice because she realized that what she had just done was traded us her Egyptian donkey pulling a cart, for our British luxury sports car. In the end, we were so glad we did have the experience that we did on Egypt Air, despite the fact it was cramped, and hot with no A/C. However the one downside was we wouldn't get miles for that leg of our journey, because it wasn't on a One World partner plane. Of course that was the whole reason for booking with BA and AA, to use our money wisely and be able to travel again soon. I didn't know this at the time of course, and it's not like I can email them now. Other than that the whole experience wasn't too bad. 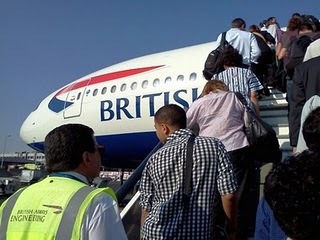 It felt like we won the lotto when we boarded the BA 777 in Cairo to return to London. I found the very last row on the port side of the craft, a two person love-seat, was the sweet spot since there's extra recline room with no one behind you, and the bulk head is a few feet back. The seats are definitely bigger than AA's 767, and there seemed to be more legroom. The food, a full English breakfast was one of my favorites I've ever had on a plane, though I was slightly perplexed how our flight attendant was French. In the end we did get to sit together on all our flights, and we learned to bend to the socialistic ways of the British. Perhaps if I just stopped trying to micromanage everything like an American and just let things be, none of this would of mattered- but never the less, I thought I'd commit these tips to words for the the next time I fly any other airline, including British Airways, because not every airline operates the American way.